Ok, shameless plug here for Macaroni Kid! This past fall I met another Ohio blogger – Bree from What Matters Most and she introduced me to Macaroni Kid – a free weekly events newsletter for your local area. Macaroni Moms scour the Internet looking for events, activities and we do a whole bunch of awesome giveaways. All you have to do to get your free newsletter is to click on this link, find your town and subscribe! It is super easy. Don’t have a Macaroni Kid in your area? There are 12 Macaroni Kids in Ohio and we are still looking for other Moms (or Dads) to grow the business! If you are interested, email me and I would love to tell you more about it. 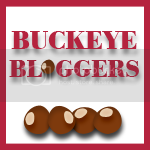 Buckeye Bloggers Link Up Details! We’ll be in Columbus on Saturday for the Monster Truck event! I got tickets for doing a push for the event and a review after the event. My son is looking so forward to seeing the monster trucks! Hope your run goes well. I can’t even imagine running 10 miles! I’ve been reading your blog for a long time now and I don’t think I’ve ever realized that you were in Ohio as well. So cool! I am so excited for Sunday! It’s going to feel like summer and my friend and I are going to be up near West Chester shopping most of the day!